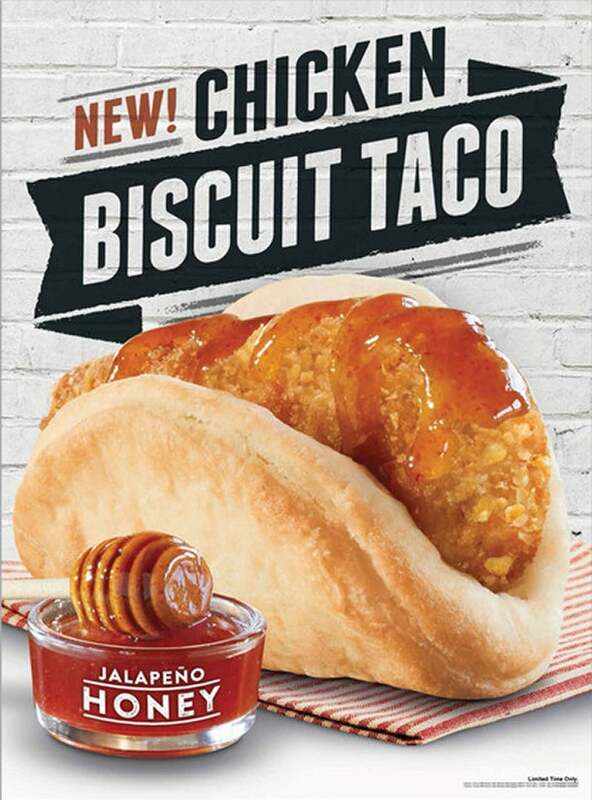 Taco Bell is, yet again, changing up the breakfast game. This week, the chain is launching the "Biscuit Taco" and taking the "Waffle Taco" off the menu. The Biscuit Taco will fit a similar model to the Waffle Taco, with taco-shaped biscuits stuffed with fillings such as fried chicken, eggs and cheese. The new menu items will roll out at more than 6,000 locations across the U.S. on Thursday, reports Bloomberg. While Waffle Tacos were the flashiest item on the breakfast menu when Taco Bell introduced breakfast last March, they have never been a best seller for the chain -- that would be the A.M. Crunchwrap. However, the Waffle Taco played a key role in spreading awareness of the chain's new breakfast menu by creating a quirky menu item prime for catching media attention and sharing on social media. The biscuit taco launch will be accompanied by a new ad campaign with a strong anti-McDonald's undertones, called Breakfast Defectors. Video ads for the campaign, created by Deutsch LA, portray a dystopian state controlled by a McDonald's-esque ruler, complete with McMuffins, grim-faced clowns and even a ball pit separating breakfast-lovers from the world of hexagonal foods. The campaign additionally has a sizeable online component, as customers are encouraged to engage with the brand on Instagram and Twitter to win prizes such as personalized action figures. Both the ad campaign and the new breakfast taco serve to position Taco Bell as an edgier McDonald's alternative – a reoccurring theme over the last year. While McDonald's has struggled as its reputation has taken hits with Millennials due to perceived health and quality issues, Taco Bell has focused on the Millennial market as it edges into the McDonald's-dominated breakfast market. Looking at the company financials, it appears that Taco Bell's breakfast efforts have paid off so far. U.S. same-store sales grew 7 percent in the fourth quarter and 3 percent for the full year. According the company, the growth was driven by breakfast sales.